Ideal for verandahs and windows the spring operated side channel awning has no cords, cleats or guide systems. Window installations can be on the face or in the reveal. Also know as Multi Stop Awnings, consisting of a tensioned top roller and side guide channels, this is a streamlined and stylish awning. Operation is manual only. By twisting the bottom rail the awning can be raised or lowered to the desired position. Locking of the awning occurs when the twist is released. The tensioned top roll maintains tension on the fabric. 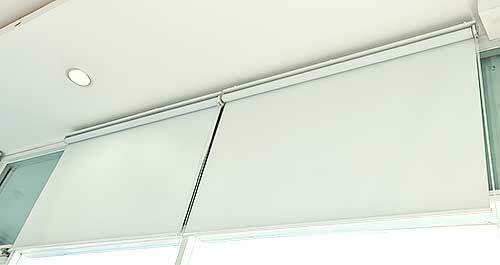 Available in multiple fabrics and optional headbox a custom solution is available for each installation. We can supply our Side Channel Multi Stop Awnings in a variety of materials and colours to suit your situation. Side Channel Awnings skins can be made from long lasting colour fast polyester/nylon blends, acrylic or canvas fabrics in either water resistant or water repellent grades. Side Channel Awnings operation is manual twist only. The benefits of fitting Side Channel Awnings include cutting down the heat, reducing household bills, reducing fading on furniture and carpets, allowing windows to stay open in rainy weather as well as increasing privacy.